Despite torrential rain and 30 mile per hour gusting winds, Boston’s Saint Patrick’s Day parade stepped off right on schedule yesterday afternoon. And while all the moisture is sure to nourish some festive green back into the city, yesterday’s pervasive gray only made for a dour parade climate. Thousands of marchers still splashed through South Boston, while the Irish by lineage and the Irish by Guiness looked on in celebration of whatever it was Saint Patrick did. Ah, Saint Patrick’s Day, a holiday that, like all major holidays, has had its original significance quickly forgotten and replaced by a loosely tangential, typically commercial, celebration. So like Halloween, when children everywhere remember the deceased by gorging themselves on Pay Days, St. Patrick’s Day too now is now celebrated with cheap costumes and gluttony. 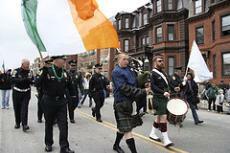 Boston is unique, though, in that it shows a sense of Irish pride every day, not only around St. Patrick’s. The city boasts rich Irish heritage and a still vibrant, if diminished, Irish community. Shamrocks adorn tourist merchandise; our basketball team is named the Celtics. While there are still those who gleefully celebrate what they see only as an honorary day for getting wasted, the overall sentiment feels more genuine. Maybe that should be expected of the American city to have first celebrated Saint Patrick’s Day, in 1737. Or of the city that has spawned many major label acts, yet still prides itself most on being the hometown of the Dropkick Murphy’s. So it wasn’t surprising to hear that the nearly 1,000 parade participants still marched 3 miles through the cold, soggy streets. Since it’s it’s inception in 1901, the parade has only been cancelled once—due to a blizzard in 1993—and while yesterday’s rain looked daunting, it wasn’t fully prohibitive. According to parade organizers, some participants did drop out partway, and attendance was far below the roughly one million strong crowds in the past. Yet a tip of the scaly cap is still in order to all those who paraded, vended, and watched in the rain. Where else can you find such determination and pride but here in Boston?